Karissa Kruse and Kevin Barr, former Chairman. After graduating from UC Davis, Barr moved immediately to Sonoma County and worked for a couple different companies. But in November 1983, “I started my own company—Redwood Empire Vineyard Management,” he states. It was not long after he created REVM that Barr became involved with the original Sonoma County Grapegrowers Association in the mid-1980s. “I was on that board for 10+ years,” he says proudly. 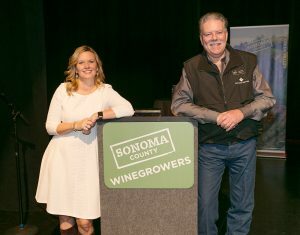 “I was Chairman somewhere along the way in the early 90s…and then, it morphed into the Sonoma County Winegrape Commission and I’ve served on that board for eight years”—the past two of which he was Chairman. In addition to his appreciation for the Sonoma County Winegrowers team, Barr also has deep respect and admiration for his fellow grape growers who serve as board members. “These leaders are all outstanding; they are a very dedicated group. I am very proud of our Commissioners and Executive Committee, and honored to serve with all these wonderful, very dedicated, bright leaders in the wine industry,” Barr acknowledges. Sonoma County Winegrowers would like to thank Kevin Barr for his commitment and hard work with the organization over the last several decades, and we are pleased that Barr will be continuing his work with the commission as the Chairman of the Sonoma County Grapegrowers Foundation.